The University of Manitoba’s campus radio station, UMFM, is back in action after successful renovations. Room 308 of University Centre was buzzing this month as UMFM hosted an open house to celebrate the new space. Guests were given a behind-the-scenes look at how the station operates and were able to sit in on live radio broadcasts. The station was upgraded as part of a renovations project undertaken on the third floor of University Centre last year. It now boasts an expanded work space with extra room to prepare shows. Along with extra room for producing and a row of new microphones, there is also a new main board that allows up to six people to host a broadcast simultaneously. The new live-band recording room is another welcomed addition to the campus radio station. McKetiak said that the benefits of a year spent breathing drywall dust are showing. 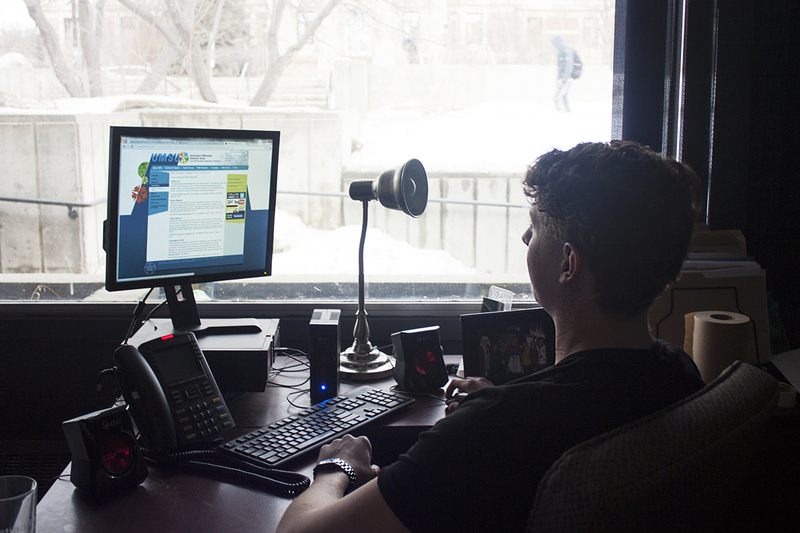 “The live recording studio is unique among other Canadian campus stations,” said McKetiak. The station has already had five bands record, and there is talk of hosting live band broadcasts in the fall. Program director Michael Elves enthused about what these changes would mean for the station. “It’s great to be able to support local musicians, to see them develop and grow as industry participants,” said Elves. According to Cathy Dowd, executive director of UMSU, the renovation was budgeted at $90,000, not including heating, ventilation and air-conditioning. The money came from the UMSU capital fund and they were able to keep on budget, said Dowd. While the station does generate some revenue through advertisements, for the most part UMFM is financed through student levies, giving UMFM more freedom than purely commercial stations; this, according to McKetiak, is one of his favorite things about the station. UMFM airs on 101.5 FM and broadcasts a range of talk, music and special programs.